I made Duo for my cousin’s baby. The yarn is TLC Cara Mia 50% acyrlic / 19% nylon / 18% rayon / 13% angora in Demin (2801), Cranberry (2376), and Winter White (2001) that I got at AC Moore. The buttons are 7/8″ from JHB International, style 92086. I used size 7 needles. 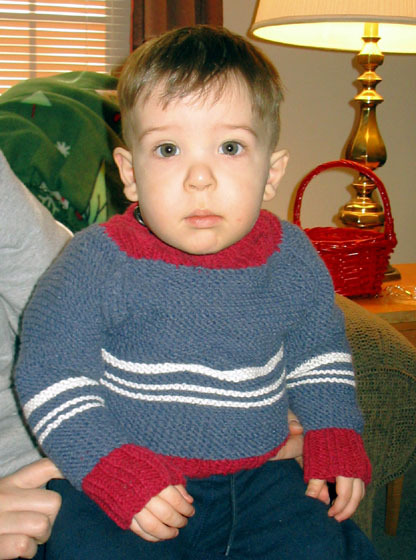 The sweater is size 2T. 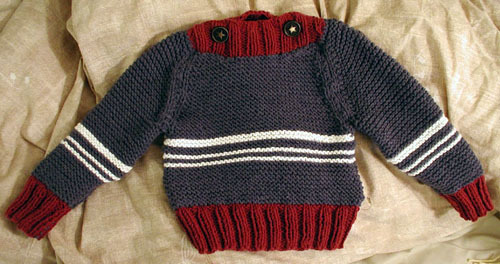 Once he actually tried the sweater on I removed the buttons. They were too close together for comfort and actually completely unnecessary, which is a shame since I love those buttons. 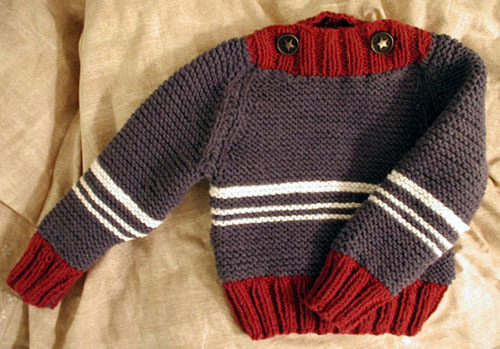 Show a picture of the kid in the sweater, it’ll be too cute! I will definitely get a pic of him wearing it next time I see him.